The coach pulls into view, slows and stops outside the cemetery gate. We’d been filming the war graves ahead of the coach tour’s arrival and with walkies talkies had co-ordinated their approach in order to catch the livery through the backlit headstones. The door opens and the group files out. Every age, physical ability and background, but here they were with one agenda; to visit the land of those who fell and died fighting for Blighty at the Battle of the Somme 100 years ago, and to remember their plight. Over the next few days we were to follow their journey from cemetery to cemetery, from ghost to ghost, from one war torn memory to the next. 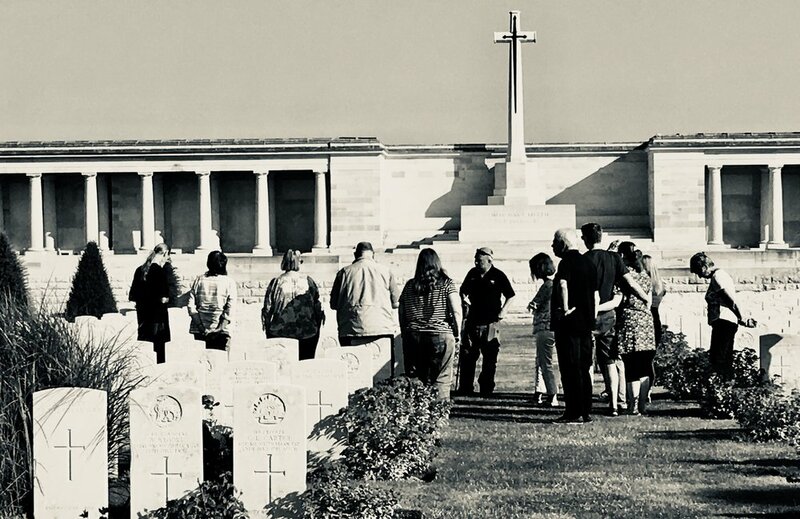 Our role was to capture the experience of the battlefield tour; that people want to come here, to commemorate, travel as a group, to be told the stories by a military historian and guide, to reflect on the past and to press a reset button on their own lives. Each person had a singular purpose and quiet intent; to pay their respects and keep alive the names and memories of those long gone. And they wanted to do it as part of a group. There was a silent solidarity in their shared mission, a graceful support as they opened themselves up to an inherited grief and sense of loss. Some had had the opportunity to meet the World War 1 veterans and heard their stories at first hand, some had had relatives who had died here, some were war history enthusiasts, some had been every year for decades, some were newcomers who simply had the yearning to come and see and feel the place for themselves. No matter why they came, they were all affected in their own individual ways. You couldn’t help but be moved. The weight of sacrifice buried in the vast landscape sits on your chest, as you hear the stories and find yourself before the stark white headstones that stand to attention shoulder to shoulder in honour of the named and un-named soldiers. At times there is an almost overwhelming communal grief that grips you, at others a solitary sadness. You feel a sense of the unbearable loss of a mother, a sister, a child that wouldn’t end at the close of battle, but would last a lifetime. Whole communities were wiped out. The Pal Regiments, made up of young mates, of villages, of work buddies, of teammates, all encouraged to sign up together, were obliterated. And everyone at Home traumatized by the magnitude of their loss forever. To bear witness to these testimonies through the accounts told eloquently and humanely by the battlefield guide and military historian, whilst standing on the very land that holds the lost souls in its belly, is a humbling experience. Being part of the group gives a united sense of solace and support with which to have the courage to hear the stories and be open to feeling vulnerable to the waves of emotion. And when you come away you are changed. You want to know about your own family history. I learned that my great-grandfather was a Chaplain in the 1st Battalion (and probably with the Black Watch Division) on the Somme and his son Robert Lindsey won the Military Cross at the Battle of Loos. As our battlefield guide Paul Reed told us, very few of our families were untouched by the war, such were the numbers who went over the top. And what we take forward by understanding the full horror and bravery of those young men, is appreciation of our own freedom, and the courage to seek peace in every way we can in our daily lives, personally, communally and globally.